Tronsnic smart plug can control your home devices accordingly to your will! 2.Search "smart life" and enable it. For more details about how to connect to Google Assistant, you can find it on the instruction included in package. ✅EVERYTHING IS IN YOUR HAND:simply with Wifi signal and user-friendly installation setup process, your devices are all under your control. Such an easy access to turn on/off appliances is excellently practical for those who're physically chanllenged or always away from home. 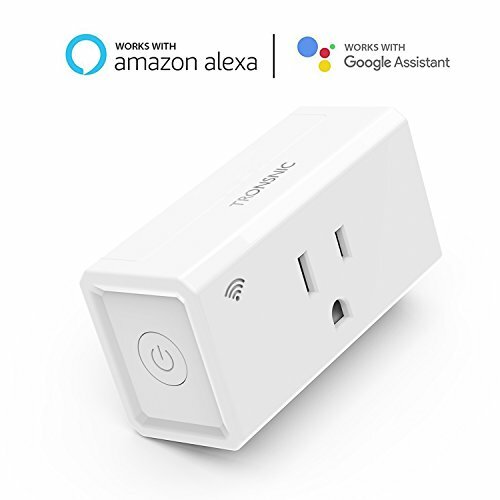 ✅AMPLIFY YOUR SMART DEVICES: Tronsnic smart plug-in switch work perfectly with Alexa/Eco dot, and Google Home with which your voice command could manage, rule and even bind all your devices. Only supports 2.4GHZ Wi-Fi network. ✅I HAVE MINI SIZE, BUT I CAN KEEP YOU SAFE: although it just occupies only one socket, a time plan can create the illusion of someone at home by turning on/off the lamp, TV or audio every now and then, keeping thieves far away from your house. ✅WIDELY APPLIED IN VARIOUS SCENARIOS: it could automatically turn on/off the light at sunrise/sunset, and you can come home with lamps, aroma diffuser, thermostats, TVs and fans on, which could help you save your electronic bill. ✅UNIQUE BUT SAFE GIFT IDEA: your friends' houses may have piled up with lots of similar gift, so Tronsnic smart plug, which is FCC and ROHS approval, can help you stand out. What's more, it enjoys 90-days unconditional full refund guarantee and 12-month limited warranty. If you have any questions about this product by TRONSNIC, contact us by completing and submitting the form below. If you are looking for a specif part number, please include it with your message.